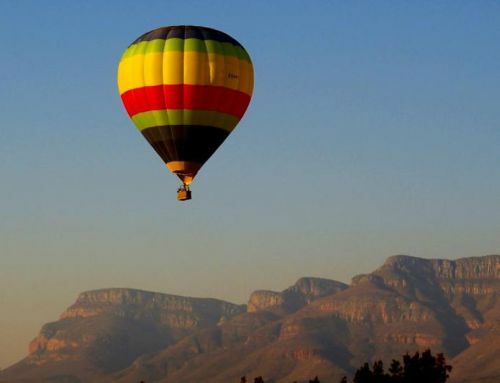 In Hoedspruit about an hours away from Sunbird Lodge, you can experience the magic of lighter-than-air flight near the foot of the Drakensberg Escarpment. We offer one-hour long flights over the scenic, Lowveld section of the Blyde River, 15 km West of Hoedspruit.The terrain is a mixture of farmland, private nature reserves and wildlife estates. The mountains to the South and West provide shelter from the prevailing winds, thereby affording us good flying weather on most days.As the sun rises, the landscape, the vegetation and, if you’re lucky, some wildlife will provide photo opportunities. Game spotting cannot be guaranteed but on most flights we see plains game like giraffe and wildebeest. Our pilots and crew will ensure a safe, enjoyable and informative adventure that will be one of the highlights of your visit to the Kruger to Canyons Biosphere.